Trocar site herniation is a recognized complication of laparoscopic surgery. Most cases have involved 10 mm or greater port, hence the recommendation to close any port greater than 5 mm. I recently had a case of trocar site herniation via a 5 mm port. 86 year old female with a previous BI gastrectomy for gastric ulcer presenting with ascending cholangitis and rising amylase. She underwent an urgent ERCP with removal of a 1.4cm stone impacted in the ampulla and placement of a nasobilary stent. She responded well with resolution of her sepsis and hyperamylasemia. F/U cholangiogram revealed 3 large 1.5-2 cm retained stones. Repeat ERCP was unsuccessful in removing the stones. The patient underwent a laparoscopic cholecystectomy and CBD exploration with removal of the stones via a choledochotomy. The choledochotomy was closed primarily. The patient did have a significant amount of subcutaneous emphysema after this 3 1/2 hour procedure (pneumoperitoneum kept to 10 mmHg). It was aysmptomatic and resolved by the next day. Postop nasobiliary study on day 3 showed no stones, leak or stricture. The patient was discharged home having tolerated a regular diet since postday one. She was admitted 3 days after discharge with a small bowel obstruction. Careful examination of all trocar site did not show any obvious herniation or masses. A CT scan was done. It was intially read as negative but retrospectively showed a herniation of bowel via the right lateral trocar site in the anterior axillary line. 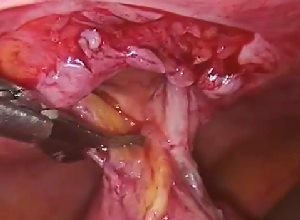 On exploration, the patient had a interparietal herniation of small bowel with a 3 cm oval defect of the transversus abdominis fascia aligned in a tranverse orientation. The external oblique fascia was intact. It was not clear if internal oblique was intact. Fortunately the bowel was viable. Abdominal ultrasound would have been a more cost effective way to diagnose a trocar site herniation. However, we were also worried about the possiblity of obstruction from the original 1.4 cm gallstone released during the ERCP if it had encountered a SB stricture in this patient with previous surgery. We were hoping to image the stone if it was there. We missed the herniation on CT because we were primarily looking in the midline for a herniation at the 10 mm trocar sites. If a trocar hernia is imaged, a limited incision may be all that is necessary to reduce the bowel and fix the hernia. I have noted on several occasions that a rather large defect of the posterior fascia can occur during laparoscopic procedures even at the 5 mm ports. An increased amount of subcutaneous emphysema is often associated with this observation. (We keep our pressures 8-12 mmHg). Trocars placed at an oblique angle, prolonged procedures, or complicated anatomy requiring significant movement of the trocar through a wide arc probably increase the risk of the creation of a large posterior fascial defect. Elderly patients seem more prone to this problem. Their tissues are less elastic and more fragile. I try to minimize this problem by entering the abdominal wall as perpendicular as possible with my trocar to keep the distance between the anterior fascia and posterior fascia as short as possible. In cases where I don’t expect the trocar to move much such as the right lateral 5mm trocar in a Lap chole, I will oblique the trocar cephalad. In this case, the trocar was oliqued medially because of adhesions from the patient’s previous surgery. In the past I have not worried about closing a larger than usual posterior fascial defect if the more superficial fascial layers were intact. I wonder if the gas dissected an interstitial plane between the muscle layers increasing the chance of a interparietal bowel herniation to occur. We have not had any experience with extracorporeal shock wave lithotripsy for biliary disease. This patient may been a candidate for that approach with imaging of the stones using the nasobiliary tube. I was wondering what experience if any other members of this list have had with this approach. In small children and infants I closed all 5 mm and above trocar site. They have less muscle mass (as your old lady had), and the potential for herniation is high. I haven’t any experience with lithotripsy for gallstones but have seen a few trocar hernias. These usually occur at the 10 mm port and usually involve omentum. I’ve been able to repair these under local in the office. Recently I removed an acute gangranous gallbladder laparoscopically. The patient, a 64 yo male, complained of severe suprapubic camps post-op which resolved by the morning. He went home and returned at one week with excruciating upper abd pain. All labs wnl. KUB ileus vs sbo. Gastroffin UGI with SBFT showed partial SBO at jejunoileal junction which resolved. Maybe this was a trocar herniation. I’ve just published a paper titled “The problem of post-lasparoscopic hernias-an easy method for its prevention”. If you can’t find the article, just let me know and I’ll send you a reprint. About the shock wave lithotripsy topic, the interventional radiologist team of my current hospital had one case experience in a very old lady. It seems a dangerous technique anyway. Have you had any herniations at 5 mm trochar sites? I do not close fascia on 5mm trochars sites and have had no herniations in the last 3 years. Maybe I should change my practise but I’d like to have some hard evidence first. Two years ago during my second lap appy in a three year old girl. This was before I start using the 3.5 mm Jarrit trocars. The small size of the infant bowel can be caught within a 5 mm trocar site. This complication was also presented by Dr Waldhausen during the IV International Congress for Endosurgery in Children. Since then I do my best (and whenever the anatomy permits) to close all 5mm trocars site in children less than 5 years of age. I haven’t been able to repair them in the office, probably because they seem to occur on the obese patients that were difficult in the first place. Would you have been able to tell with lateral or oblique views on the gastrografin UGI? Being a lousy laparoscopic surgeon I did not want to comment on the issue of hernias after the use of a 5 mm trocar. After reading the above I cannot keep silent. Why for God’s sake anyone wants to shove -in a trocar and a laparoscope into the belly of a small kid suspected having an acute appendicitis. What pathology do you want to exclude? For years and years we managed these kids effectively and safely via a 1.5.-2 cm’ incision and now they want to puncture these small abdomens with multiple trocars-prolonging the anethesia, wasting money and soforth. Perhaps the 5 YO kid wants to return to school earlier? Or perhaps the 5 YO lady wants to start lifiting weights in the gym. Or maybe the pediatric surgeons want to be “modern” as their friends in adult surgery think they become.